Water temperature remains in the low 60’s and water clarity is about 4 feet visibility. We received a decent amount rain this past week and the visibility of the water should clear up in the next couple of days depending on the weather. Catfishing remains fairly good with limits still getting pulled out. With the rain this past week catfishing should pick up a little. Early morning fishing around the island and night fishing near Indian cove and the first dock on the east shore trail is keeping anglers busy. The best bait to use when fishing for catfish is either chicken liver, or mackerel. Make sure to cut 2” inch chunk of mackerel and putting it on a size 1 or 2 hook and half ounce weight works best. A simple trick to use when using this bait is wrapping magic thread around the bait to ensure that it doesn’t fly off when fishing. Trout fishing is starting to pick up. A couple limits have been reported getting caught by the first dock and down by Indian Cove. Power Bait, especially mice tails have been pretty consistent with catching trout. When setting up, make sure to use a sliding sinker set up with a ½ oz. weight and at least an 18” leader line. Water temperature remains at the low 60’s and visibility is about 4 feet. We are expecting another trout plant any day now. Bass fishing had an amazing week here. A new lake record was set here by Ryan Reynolds of San Mateo. He caught an nice 19 lbs. Largemouth Bass fishing near Alder Point using a black jig. He was using a Shimano curado E7, on a Loomis 7’ rod with braided line. This bass was weight on two different hand scales and was carefully released back into the lake. Video and picture of this bass is located on our Facebook page. Congrats to Ryan Reynolds on catching this huger whopper size fish. Please practice catch and release for bass, as they are not stocked into the lake and their population depends on you!We encourage all anglers to report their stories, comments, or concerns to the Marina. Please email us at swong@calparksco.com. Please follow our Facebook page to keep updated on fishing conditions. 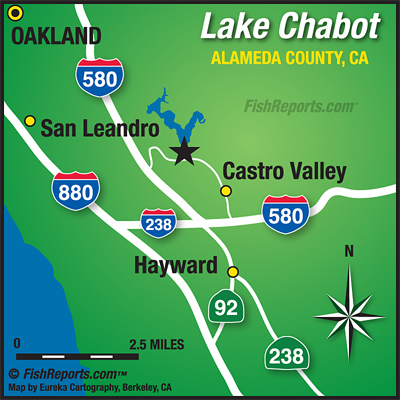 Thanks again for choosing Lake Chabot as your recreation destination. 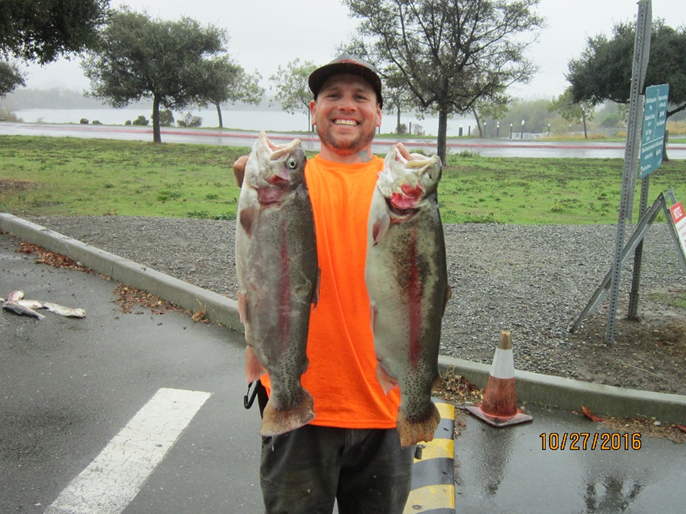 Ryan Reynolds of San Mateo caught a 19lb. Largemouth Bass near Alder Point.